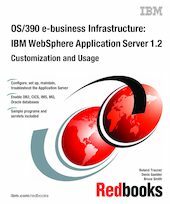 This IBM Redbooks publication will help you understand, configure, and use the IBM WebSphere Application Server 1.2 for OS/390. The material for the book was developed using OS/390 R8 and the IBM HTTP Server 5.2 for OS/390. This book is for webmasters and system programmers who install or customize the IBM WebSphere Application Server for OS/390. We describe how to configure the Application Server and enable subsystems to use it. We also provide sample programs and servlets, and give information on more advanced WebAS (WAS) configuration and performance tuning. In Appendix C, we include a relevant portion of the softcopy document WebSphere Application Planning, Installing and Using Version 1.2, GC34-4757 to help you perform both basic and advanced servlet administration tasks. This book should be used in conjunction with OS/390 e-business Infrastructure: IBM HTTP Server 5.1 - Customization and Usage, SG24-5603. It is an update to OS/390 e-business Infrastructure: IBM WebSphere Application Server 1.1 - Customization and Usage, SG24-5604 (level 00).